Today is Opening Day in Major League Baseball. It is a day of enthusiasm around the sport and the highest water mark of hope springing eternal for the 30 major league franchises. That will last for about another few hours and then the party will dissipate rather early for many teams as their weaknesses begin to bubble up to the surface. For the Rangers, this is not likely to be the case (at least early in the year), but it has been a historic spring training where the usual over-reaction to every negative piece of news has not really felt like an over-reaction because the cumulative total of the news has actually been quite disheartening. What started as merely Derek Holland and his dog falling on the stairs (60 Day DL, Knee Surgery) has added up into stress regarding Harrison, Lewis, Profar, Andrus, Soto, and yes, even the indestructible baseball cyborg named Darvish. Nevertheless, the Rangers are considered a contender as we open the season today to the AL West crown and to return to the post-season after a 1-year (feels more like 2 years given the 1 game of 2012 - JOE SAUNDERS!!!!!) absence. That can go south in a hurry if health doesn't start cooperating, but at least for now, take heart, everybody. Now, what about the area colleagues? Well, on the morning of Opening Day, The Dallas Stars are said to have a 63% chance of making the playoffs with 8 games left to play according to various computer simulations. They are a young and exciting team with what appears to be a very bright future, but whether this might be the year they can get back in the playoffs and keep their drought from reaching 6 playoff years remains to be seen. Meanwhile, the last champions from our fair city, the Dallas Mavericks wake up this morning with a 79% chance of getting in (thanks to the Phoenix Suns losing last night) and appear to have a pretty good chance of making sure their one year out of the playoffs doesn't become two in a row. They have been the model of quality for over a decade (never leave us and never get old, Dirk) and while we don't have a great idea of what the future holds with the Mavericks like we might with the Stars, they have certainly earned the benefit of the doubt due to their reputation and their owner who likes losing about as much as he likes referees. The Cowboys are the Cowboys and therefore to say they won't make the playoffs is ridiculous because they have been playing for the post-season in each of the last 3 years in the final game, but they have also lost all 3 of those final games and therefore, to say they will make the playoffs is equally ridiculous. They are close enough to be in the mix, but far enough to be a punchline as well. 8-8. But, as you can see, with one more missed postseason this fall, they will equal the 1986-1990 drought that is the longest since the franchise first made the playoffs back in 1966. That, for one of the proudest franchises in the business, is clearly a very poor sign of what is to come, and with an aging Tony Romo it is tough to say there is a bright future straight ahead. I have been tracking these numbers for quite a while, but not since 2013. So, below is a chart that runs from 1994 until today. Why 1994? Because that was the first time our city had a team in each of the "Big 4" sports. Since then, every year at least one of the big 4 would be in the post-season. Until 2013. 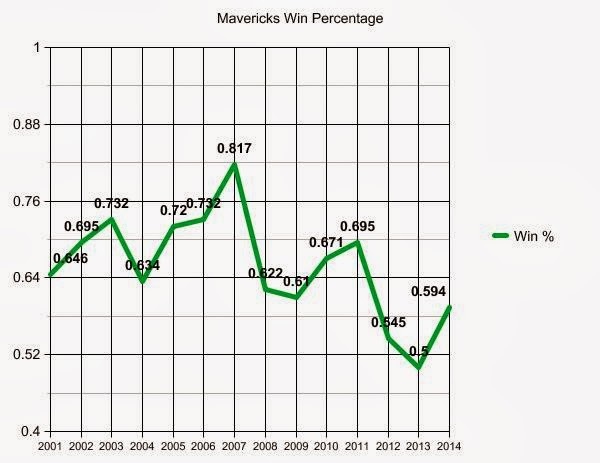 Now, in 2014, the Stars and Mavericks look like they have a solid chance of breaking this drought, but I am not sure with 2 weeks to play that anyone is willing to bet on it. At best, it looks like #8 seeds and that could be a playoff time and over within a week. But, of course, the whole point of all of this is supposed to be getting in and seeing if you can get on that Cinderella run. Not overly realistic, but since the #8 seed Los Angeles Kings won the Cup, then there is always that chance. So, after a historically bad 2013, they are trying collectively to rebound in 2014. We won't hold our collective breath just yet, but with the Stars, Mavericks, Rangers, and Cowboys all on the fringe, the odds of going 0 for 4 again aren't great, but also aren't impossible. This is the longest city-wide drought since the Big 4 have all been here. Will it end this month? There is no position more vital to winning in the game of football, and therefore there is no position more discussed each draft year than the QB category each spring. And rightfully so. We spend plenty of time on each of these guys to see which we will still be talking about in 10 years. Because the draft has certainly demonstrated that the 10 year lifespan is what you are going for so that your franchise is safe and secure in this most important of all spots. Can the guy ever be a starter in the NFL? If so, can he work his way into that coveted group where we wonder whether he can be discussed amongst the top 15 QBs in the league (a better then average, top half of the league QB). And if so, does he ever become the best of the best, where he is in the top 5-6 QB1s in the league - and people throw the most coveted of all labels around: Elite! Let's look back just a bit before we grab this year's bunch. In 2003, who were we talking about? Well, according to our guy's at Ourlads scouting services, the Top 10 evaluated QB prospects in their guide to the NFL Draft were the following: Byron Leftwich, Marshall - Carson Palmer, USC -Kyle Boller, California - Rex Grossman, Florida - Drew Henson, Michigan - Chris Simms, Texas - Dave Ragone, Louisville - Seneca Wallace, Iowa State - Brad Banks, Iowa - and, Kliff Kingsbury, Texas Tech. How is that for a list of distinguished gentlemen? The also-rans in that category included Eastern Illinois' standout, Tony Romo. And I think we can all agree that he has achieved the greatest heights of this class, even though that was certainly not apparent to anyone in his draft year or even in his first several years in the league. 2004 was a different situation altogether. That was the draft that featured 3 QBs that have been in the elite discussions for years, and with 4 Lombardi Trophies in their possession, they can compete with mostly every QB class. Top 10 there? Eli Manning, Mississippi - Ben Roethlisberger, Miami (Ohio) - Philip Rivers, NC State - JP Losman, Tulane - Matt Schaub, Virginia - John Navarre, Michigan - Cody Pickett, Washington - Josh Harris, Bowling Green - Luke McCown, Louisiana Tech - Rod Rutherford, Pittsburgh. The also-rans that year featured big Jared Lorenzen of Kentucky and BJ Symons of Texas Tech, but nothing that made an impact on the NFL. And then, 10 drafts ago was 2005 (counting 2014) and that gave us another wonderful QB debate at the top of the draft that that year actually had Ourlads making it a 3-man race and their favorite QB was Charlie Frye from Akron. Then, Aaron Rodgers, California - Alex Smith, Utah - Jason Campbell, Auburn - Kyle Orton, Purdue - Adrian McPherson, Florida State - David Greene, Georgia - Andrew Walter, Arizona State - Stefan Lefors, Louisville - Ryan Fitzpatrick, Harvard. Oklahoma's Jason White, Chance Mock from Texas, and Sonny Cumbie from Texas Tech were also in the group, but it was pretty top-heavy. So, that was almost 40 names from 3 consecutive draft classes, and there were about 8 NFL starters in that group (guys who held the job for more than a cup of coffee) and I suppose half of that number would be in the mix for the elite discussion with Roethlisberger and Rodgers ever actually taken seriously in that "elite" talk league-wide. That is simply to demonstrate what history has proven to us again and again. There are a lot of "interesting kids" who play QB at a very high level in college football. They take major universities to destinations of every alum's hopes and dreams and marry the cutest cheerleader. But, when it comes time to do it on Sundays, even that group of accomplished QBs are still hitting on an absurdly low hit-rate. 40 names, easily 40 more QB prospects from 2003-05 that I did not name who were all college starters and successful at the next highest level of the sport and it just produced about a 10% yield for even just 4-year starters in the NFL. So, as we look at these guys and try to find the next big-time starter, keep that in mind. 10 prospects, 1 guy will be in the mix in 10 years, and that could be Alex Smith or Matt Schaub. If you want Roethlisberger or Aaron Rodgers, then your odds go to about 1 for every 40 prospects - regardless of round or paycheck. On the other hand, if you are looking for Rodgers, Roethlisberger, Manning, Rivers, Smith, Schaub, Palmer, or Romo, you better remember that only Romo was not a 1st round pick in the entire group. So, this idea of finding a guy who slips through the cracks - like Tom Brady or Tony Romo - just know that this doesn't happen much at all. People want the Cowboys to get their "QB of the future" with a 3rd or 4th rounder. If you start to put a list together of all of the teams that have actually found their guy who started at a high level for 5-6 years and found him in the 3rd or 4th round, the list would be very, very short. As we look at the class of 2014, it is best to just keep those numbers in mind. There are QB prospects I like and others I don't, but in the end, when they are all passing their 30th birthdays, the odds tell us that most of these guys will be high school football coaches or running an insurance company rather than starting an NFL game in 2022. I want it to be noted right away that none of these QBs are perfect. I am looking for flaws in their games when I am watching them and trying to pick out 3 big opponents so that those flaws stick out. That doesn't mean they are bad QBs, it means they are QBs. All Quarterbacks have a weakness. And the Bortles weakness is that he will lock on to a guy and his eyes betray him at times. So much of QB play at the top level is not allowing your eyes to give you away. You must look off the safeties because they are using all sorts of "tells" to figure out where you are going with the ball. Lock on to a guy and you are asking for trouble and a Pick 6. This guy is so big and so agile with his feet that you have a real hard time not falling for him and what he could be at the next level. So many of the best QBs today are able to run on 3rd and 8 when you go into man coverage and your defensive backs have their backs turned to the play. This extends drives and causes frustration from the defense. Bortles should be able to do that a ton and have the build to not take on too much damage when he risks a hit. He will be a tough guy to tackle downfield. Without saying he has a massive arm that can make all of the throws, you can still see that he can do it all with his arm and his feet. He is able to assist your OL because of his movement skills and his build that allows him to avoid a few arm sacks. He will throw it in coverage, but he also will want the ball right back to go make things right. He stands tall and throws strong and is able to throw guys open. I don't love the fact that he appears to be vulnerable to coverage in a way that LSU's Mettenberger has a better feel for manipulating safeties, but Mettenberger cannot show any of the feet skills that Bortles does that might more than make up the difference. When looking for a QB to lead your franchise for what you hope is the next decade, it often becomes a game of seeing who scares you the least. For most in this draft, Bortles is the one who is left standing when you play that game, and I would not disagree with that consensus. He seems the one you would vote most likely to succeed. What I said above about Bortles doesn't mean he is who I would go get if I am on the clock in the draft. I recognize that Bortles has less to be concerned about and is a safer, more logical conclusion. But, when preparing for this draft, I was going to attempt to forget that I had seen pretty much every snap of Johnny Manziel's college career and watch him again with eyes that were critical and finding reasons why he cannot succeed at the next level. And yes, his bone-headed throws into coverage will lose games at the next level. There is simply no way that a guy who makes those decisions will ever have that fully coached out of him, because any true gun slinger is ok with a few bad throws if it leads to 10 good ones. And, to take those instinct decisions away from him would destroy the whole appeal of taking a guy like him in the first place. What makes Manziel great is that while he is a strong QB in the first 3 seconds of every play, he is even better - and maybe among the historical greats - when the play breaks down in the next 3-5 seconds and he defies the Xs and Os as he is going along. Further, when you look at his Int%, you will see that while 2.5% is higher than most of the rest of the prospects on this list, it is not significantly higher. To hear some talk about his interception rate, you would think it would have to be double the field, and it isn't even close. He is making mistakes, but in the SEC against the best competition that you can find at the college level, he still was lighting them up at a 3/1 TD/Int rate. He also has a major league arm (I don't know how people can watch him play and question his arm strength as he delivers a lot of frozen ropes) and also has the best completion percentage of any of these Tier 1 guys. He seems to have no problems finding guys and hitting them to move the chains. Then, his next-best trait, which is his ability to almost never get hit hard when on the move. He runs like a RB and that is not just something Barry Switzer said. It is true. He ran for over 2,000 yards in 2 seasons as a QB and a yards per carry of 6.3 - again, in the SEC against NFL-ready defenders. But, more than anything, he seems to have the knack of competitive drive that is really clear through the screen. He wants the ball and demands your attention and will not go down without a battle on his hands. I know this is very difficult to measure and count on at the next level, but enough NFL people are saying that this is the closest to Favre we have seen since Favre that you are willing to at least give it all a chance. Now, the very clear negative is his build. He does take a beating in the pocket and he is not 6 feet tall, nor overly muscular. We saw Michael Vick take beatings and miss time in an awful lot of seasons despite being elusive. We also saw Duke knock Manziel senseless during the bowl game and I can tell you that the NFL has athletes that Duke doesn't have. There have been many a folk hero carried off on a stretcher on Sundays and that is really going to be the entire game with this guy. Highest ceiling? Absolutely. In fact, if you need a QB and don't take him, you better be ready to explain that to your fan base for the next decade if he is what we think he might be. But, he is surely a guy who comes with a fair amount of risks and of course, the possibility of some headaches, too. Will he be a diva at the next level? We would be silly to say it is impossible. I would bet on Manziel, but I would also not tell you it is a sure thing. Unlike other positions and even other sports, QB is definitely one where we try to measure a player's ability when the odds are stacked against the boys and even though we know that every snap and every possession is important, some inevitably are more important than others. Is there a player who seems to play his best football at the most important time of the game? Well, that is Teddy Bridgewater's appeal. Not to mention that in an offseason of people watching Manziel's party tour, we saw Bridgewater's TV appearances where he wore a suit and conducted himself as a distinguished gentlemen who was an alternative to the Frank the Tank persona of Mr Manziel. That scholarly approach delighted the media and before long, he was the #1 pick on most people's boards. I would watch him play in the fall and while I liked his overall package, I got the sense that the media narrative machine had propped him up a bit higher than he belongs as their way of taking the shine off the Heisman winner in College Station. But, with a fresh set of eyes on 3 of his games from last fall, I tried to forget all of the noise that really doesn't matter and just zero in on his skills as a QB prospect. Is this the type of guy who we will still be raving about in 5 or 7 years as a stud starter at the next level? He, unlike Derek Carr, saved his best for last and finished his college career with a clinical dismantling of Miami in a Bowl game that was stunning. He has a nice quick trigger and gets the ball out quickly. His underneath accuracy is a bit troubling at times, but he obviously puts it where it needs to go most of the time. He has a good decision clock and can manipulate safeties like a veteran QB to create spots to throw the ball down the middle deep. I do think his arm looks a little off on the NFL throw - sidelines, frozen rope, 18 yards downfield. But, he does a ton of damage in the middle of the field and on the shallow flanks - which of course is the place most college QBs are going over and over again. He had a few games where he looked in accurate, and the Cincinnati game in particular was not something to champion, as well as a number of games where his accuracy was certainly affected relative to the amount of pressure he was under. For me, with his slight build and some inconsistency in his play, I have him 3rd on my list. I just don't see this #1 overall business, but then again, I don't spend time with these prospects like NFL teams do, and it seems like that is where he dazzles people with his convincing interviews that tell you he is all football all the time. When you compare a QB to another QB, you wish they would run similar systems so it would seem to be apples to apples a bit more. But, that is not the case, so you have to try to imagine what a guy can do and what he won't be able to do if he is not in that exact environment. Fresno State, as far as I could tell from watching the USC, SD State, and SJ State, Fresno is in the shotgun at all times, spreads you out, and then generally makes sure that they are stretching you from sideline to sideline and then throws a number of 3x1 or even 4x1 attacks (with 4 WRs to one side in the diamond from Varsity Blues) and bubble screens you into a slow death. Now, this is a very attractive strategy to make a defense want a vacation, but as far as showing off what your QB can do, it hides that pretty well. He throws a ton, but he makes throws that you would expect the Southlake QB to be able to make in a similar fashion. He throws the ball beautifully and it looks effortless and he is clearly the little brother of David Carr. Unfortunately, many of the beautiful balls downfield were missing their marks, and against USC in his final game in college, he picked a poor time to put his worst work out on the field. That day, with an amazingly low 4 yards per attempt, he looked as ordinary as he could possibly look. But, we try to watch a lot of games so that we don't just see him on a bad day or in a bad matchup. And, to his credit, if you want to find him in his best form, the trip to San Jose State to play David Fales head to head was an instant classic that should be found. That day he threw for 6 Touchdowns, 500 yards, 10 YPA, and still lost by 10 points. But, on that day, he was all over it with a great pocket presence and with his great receiver DeVante Adams (also a top prospect in this draft), they put on a show that we won't soon forget. He gets bumped up in his grades for being a fantastic athlete who can certainly run for a first down when he needs to and has blazing speed that is close to Manziel. He throws the fade with ease and does so repeatedly. But, for me, the accuracy is an issue and so is the way that he just never seemed to have to throw the ball downfield as his bread and butter. Screens are nice, but they don't tell you much about his game, and unfortunately, that was the majority of his diet from the games I watched. I like him, but I might like the guy below him here even more. OK, I have read plenty about Fales and with the Senior Bowl week, he definitely was one of the QBs who was exposed to scrutiny for months now. He runs an offense that certainly loves to sling it around, but in a much, much more vertical fashion. Fales fires the ball all over the field and he does it very, very well. In a few of the games I watched (Minnesota and Colorado State) he absolutely put on a clinic with accuracy. Not every ball was completed, but as a QB, he did everything he could to place every throw right between the numbers of his targets. He is really accurate. In fact, that might be the #1 trait for this QB, and I will tell you, that can take you a long ways in the NFL. Accuracy has made some QBs - Drew Brees and Aaron Rodgers, and it has taken others down over the years, as well. So, if you had to choose, you might take the slightly less arm, but higher accuracy prospect. And if so, you would be on Fales. He also seems to have a real good feel within the pocket. He can buy himself some time with his feet, although he is surely not a guy looking to run for the first down. He is moving to make a throw. Now, the knock on him is that his arm may not have the gun that you wish he has. And in the NFL that is an issue at times, so I watched quite a few of his games and tried to look specifically for laboring to make a throw. Again, does he have the ability to throw a 30 yard pass on a frozen rope? Maybe not, but he does make throws all over the field, with most of them down the field and stressing a secondary. And his throws are finding their marks and he is throwing guys open. He battles and looks like he is running his huddle and scratching and clawing to move the team at crunch time. I don't want to tell you he is going to be Drew Brees, because that sort of thing is just silly. But, he has the things I value in a QB and I came away liking Fales way more than I expected. I would think he would be a consideration for the Cowboys if he makes it to them in Round 2. But, that may not come close to happening. Mettenberger certainly has a story that makes his total profile a bit more of a work for a football department that wants to make sure they know everything about him before they allow him to run their team. He was kicked out of Georgia back in 2010 for a bar incident that derailed his football career rather abruptly. He also just suffered an ACL injury to end his season in November against Arkansas that has kept him out of the combine and the normal spring activities that get people all fired up about a prospect. But, make no mistake - this guy is very good. In fact, if we were looking for a stand-up, stand-tall in the pocket QB prospect with a cannon for an arm, I believe I would be tempted to claim this LSU prospect might be the most impressive of the whole bunch in that regard, but at least right there with Bortles. LSU's offense also makes him run what most NFL offenses call a normal set, rather than so many of the prospects running 100% shotgun and extremely pass-heavy offenses that are growing on everyone. Mettenberger has the ability to make all of the NFL throws and make them with ease. His accuracy is not a 10 out of 10, as he will miss some throws, but I wouldn't count it an issue more than just something to be aware that he isn't as accurate as David Fales. But, he is a very impressive big man who can run on the rollouts with his eyes down the field. He can make those strong throws and put them where they have to be. His 2013 had a YPA at 10.4 which is really insane. However, the point that distinguishes his from many of his counterparts is that I think his decision making might be at the top of the list. He makes very clear and decisive reads and looks the safety to one target and then picks the more appropriate place to put the ball. He also reloads well when he is looking somewhere and then realizes he can't throw it there safely, so reload and find #2 or #3. His reads are solid in the games I watched. So, huge arm, good brain, and great physique. But, ACL, not great running skills even with good knees, and a bit of a spotty record off the field. I think he is one of my favorite QB prospects of them all and I wouldn't be shocked to see him go in the 1st round. And, if he is there when the Cowboys pick in the 2nd round, you better believe I would be pounding the table on this one. Here is a guy who has been the darling of many draft experts on the NFL Network and elsewhere, so I was hoping to like him more than I did. Also, we cannot get past the fact that he went to Eastern Illinois, set passing records, and won the Walter Payton award, all just like Tony Romo did a decade earlier. In fact, he smashed quite a few of Romo's records. When I watch Garoppolo, it is clear that he throws under, under, under, and then play action over the top for an impressive score. That certainly works and I am not trying to belittle that in any way, but the horizontal passing game that he was a part of at Eastern Illinois makes him a fine candidate for Nick Foles' job, but otherwise, is not what I am looking for in the NFL as far as the ability to throw into tight spots down the field. He does some things very well, in fact, as far as those deceptive play-action fakes that can freeze a linebacker and open a passing lane window so he can fire a pass through it, he might be the best in this entire bunch. He also, has a very Romo-like ability to feel rushers and move around to extend a play with eyes in the back of his head sometimes that is certainly not a learned trait for most QBs. He has a strong arm and can do some nice things, but the thing that chased me off him a bit was that he had a bit too much gunslinger in his DNA for my liking. Now, that might conflict with my previously stated thoughts on Manziel, and for clarity, allow me to say that gunslinging is an art that is completely governed based on the upside. With Manziel - and Favre before him - the upside was so amazingly high that you took the boneheaded throws on occasion as collateral damage for the 4 or 5 great ones. But, that ratio is a very important balance and if it ever gets too close in the other way, you are playing the wrong QB. Now, Garoppolo's ratio was not in question this season with a crazy 53 TDs/9 INTs, but I am telling you that if you watch his games - Northern Illinois was the big one for me - he threw a couple and threw a couple more that were dropped INTs. He throws into coverage way too much. He doesn't make safe throws and this could be a product of over-confidence and even cockiness at that level, but it scares the heck out of me for someone who has to make such a jump to the NFL level and those windows are so much smaller and the schemes so much more complex to confuse you. On the upside, he gets the ball out quick. Quick motion, quick decisions, and he usually takes the smart throws underneath. I bet he would be a real candidate for the spread that works the horizontal match ups hard. But, man, when he gets the rush of blood to his head, he seems to lose his mind a bit and that is why I would put him at the bottom of this group. My summary is this: Bortles is the pick if you want to sleep easy. Manziel is the pick if you like to gamble. Bridgewater is a tier down. In fact, Mettenberger might be better than Bridgewater, were it not for the ACL concerns. Then, David Fales is a guy I really like at the right price. I have not seen the Derek Carr fascination that some have, but I admit I champion the downfield gunner more than most. Then, Garoppolo is 7th out of 7, and there might be a few guys who belong in his class that I did not profile in this batch. We have profiled 50 players now (which was my original goal of looking at the Top 50 with heavy leanings on Cowboys' positions of interest), but now I think we will build our first board with the positions we have done for next week. Then, in April, we can still do WRs, CBs, and at least browse the RBs and TEs and we will be ready to go. If you know me even a little bit, you know that I have looked at the Stars fortunes as a franchise over the last 15 years from every possible direction. During hockey season, I absolutely see every shift of every game and do not enjoy being unable to do it live on those rare occasions where that cannot be avoided. I follow this team very closely, and therefore, have clearly crossed the line from covering a team as part of a job description, into following a team that I wish to see do well. I would never call myself a cheerleader, in fact, many of you think my brand of tough love when I follow this franchise is actually over-harsh, which would fall in line with my natural pessimism about my team's fortunes. I learned long ago when having a team that I love that my best ability to cope with failure was to expect it. That protected my spirit from being crushed when the opposite is true where you always expect success and then are steamrolled when they fall short of your hopes. Therefore, I generally find myself entering crucial games with a bit of a sense of dread, feeling like I know what is around the next corner. 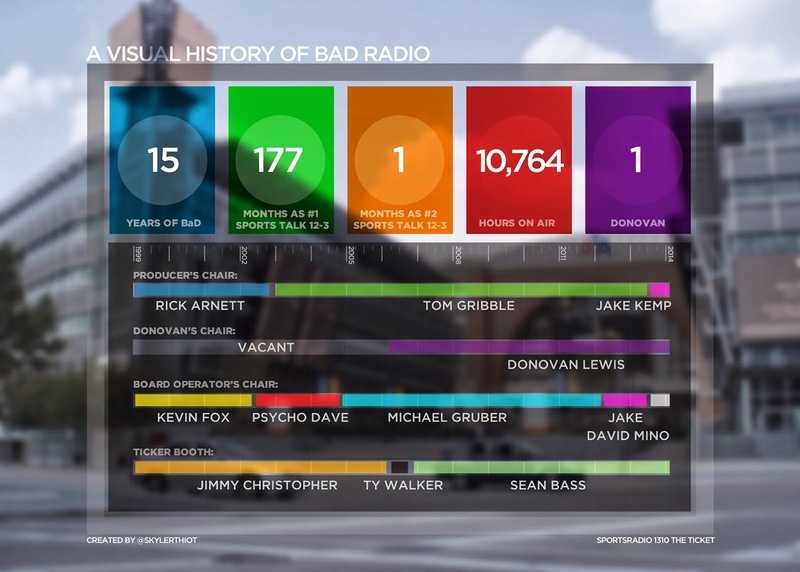 Bad things, man. And then, when my side shows it can handle this challenge, I am very pleased. Happiness is such a pleasant surprise in sports. Expect the worst and you will never be disappointed, right? I realize this tact is not for everyone, but it helps. The weird thing is that I haven't felt it much this year. I find myself as optimistic as I am capable of being with this version of the Dallas Stars. I think this team will make the playoffs and I think when they do that they will be capable of turning some heads. I also think that this is the tip of the iceberg of what the next 5 years or so hold. I am not saying it is rational, in fact, I would argue that feelings about a team or a game are generally irrational. I don't know why I feel pessimistic about my teams most years, but this year optimistic about a young group in Victory Green. It has very little bearing on the outcome, either way, so don't worry about me. But, I do have to tell you that as we have played out the string of the spring of 2014, we are nearing a place in the schedule where there is a very huge disturbance in the force. In a season where I have had the cup half-full for the entire campaign, I will confess to you, loyal reader, that the next portion of our ride comes with an advisory and a warning to take heed. If you touch a hot stove enough times, you begin to train your behavior to avoid hot stoves. These trained feelings reappear when conditions are right. And look, we have arrived in a spot that is in close proximity of a hot stove. The Stars played Game #70 on Saturday afternoon. It was a wonderful day where they took down Ottawa in a game that required a committed effort and another Saturday where a late push took the game over the finish line in the right direction. It was a game of determination, strong goaltending, bad feelings, and secondary scoring - all good things that lead to success in the playoffs. The win combined with a Boston win in the desert against Phoenix put the Stars back in a virtual dead heat with the Coyotes where on this day the Coyotes have a 58% likelihood of the post season and the Stars right on their heels with a 51% case. Phoenix has 11 games to play on 79 points and the Stars sit at 77 with 12 to play. Dallas has 5 more at home, 7 more on the road. The Coyotes have 5 more at home, 6 more on the road. The Stars will need to go out East one more time (which has been a real issue this year) and the Coyotes are on an airplane doing that this week. Dallas owns the tie-breaker with 1 more regulation win at this juncture, but as I have said plenty in the last few weeks, this is most likely going to roll all the way to game #82 in Phoenix on April 13 for all of the marbles and the right to open in the playoffs against St Louis. So let's get back to why Game #70 is associated with the 5 year trend of Stars issues and why they have to now prove they can run the next 3-week gauntlet that lies ahead of them. In the 2008-09 season, after 69 games, the Stars were sitting pretty at a spot in the standings that was the #8 seed and were tied with Minnesota for the final playoff spot after 70 games at 74 points. Unfortunately, they finished the season on a run where they only won 3 games the rest of the way and ended the year on a 3-7-3 slide altogether to finish 8 points out of the playoffs and saw everyone fired. In 2009-10, they were never really in the race, but for the sake of the conversation, let's remember that it was an Olympic-break year and that the team was the only team in the NHL to not win 3 consecutive games the entire season. They did go 7-5 down the stretch, including the fairy tale like endings for Mike Modano, Marty Turco, and Jere Lehtinen, but they finished 7 points out of the playoffs. In 2010-11, they were in the 7th playoff spot after 70 games at 82 points (wow!) and actually were in a great position, but it was a very tight pack of teams as we would soon find out. They then collapsed and lost 7 of 8 games after Game #70 and ended up the final dozen with a 4-8 record and finished with an amazing 95 points, but as you will recall needed 2 more to make the playoffs and fell short the final day in St Paul against the Wild who spoiled the party to say the least. 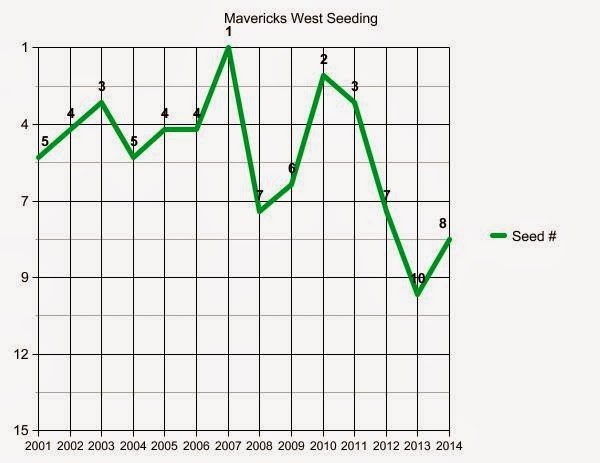 The next year, in 2011-12, they were leading the division by 4 points and therefore the #3 seed at the 70 game mark. They were in maybe their best spot in this run with 12 games to play. They then absolutely fell on their faces again, finishing with just 3 wins in the final 12 games for a 3-9 record that was absolutely as gutting as it gets. Somehow they went from 4 points up to 6 points back in just a dozen games as several teams zoomed by them in Glen Gulatzan's first year. Finally, last year was a much more truncated 48-game season, but with 12 games to play (what would normally be the 70 game mark), they were 3 points out of the final playoff spot, and they actually caught fire and won 5 games in a row. Unfortunately, they ended the year losing 6 of the final 7 and finished 7 points back again at the end with a 6-6 record down the stretch in the final dozen games. 60 games and 24 wins with 8 consolation points for 56 points in 60 games. If you just count the 4 years they were actually in contention, that falls to 17 wins in 48 games with 7 additional points for 41 points. How does this not apply to this 2014 Stars team? Well, aside from Trevor Daley, nobody is left from that 2009 team. Jamie Benn and Kari Lehtonen joined in 2010, and then came Alex Goligoski in 2011. Those were the only 4 players who were in that game against the Wild in April of 2011. The point is, that even though these last 5 years are fresh in our heads, most of them wearing Victory Green have been a part of between none and one or two of these 5 runs. If their name is Tyler or Val or Sergei or Colton, they have no idea what you are talking about when you talk 2012 Stars collapse with them. Sure, the arena is the same. Ralph and Razor are the same. I am still watching them play and so are you. Beyond that? Well, not much. Now, how does that apply to this season? Well, these boys might be new, but they still have to prove they are different than those that came before them. 12 games to play. I think the Stars need a 9-3 finish to get in, with the outside possibility that 8-4 (93 points) can also get them in if one of those 8 is in Phoenix. The math is not easy and with road games at Chicago, St Louis, Tampa Bay, and Washington all ahead it is going to be a real test of their mettle. Can they pass the test of the final dozen games? I think this is their year, but there are no more mulligans to play. The importance of each game is huge and obvious. They look to earn their own identity. This is the way to do it. You may remember 2009 as the last time the Cowboys had an offensive line that seemed ready for action and a strength of the team. I often remember the day at Arrowhead Stadium that season where Marion Barber and the offensive line had their way with the Chiefs defense despite declaring before the snap that another ground and pound play was coming right at you. And who is going to forget back to back weeks in September where that offensive line, bruising back, and 2 blocking tight ends gouged the Giants and Panthers for 460 yards on the ground in the first 2 games ever played in Arlington? In the last decade, 2009 is easily the year that this team ran the ball most effectively and ran it without gimmicks. They did not rely on shotgun runs or deception. They had beef up front and we actually capable of bullying a game at the line of scrimmage. That was 5 years ago and none of the 5 starters are still here, with Doug Free being the only holdover at all, but the Cowboys owned the offensive line and also won the division and went to the playoffs. As you can see, along with Flozell Adams and Marc Colombo on the flanks, the interior was Kyle Kosier, Andre Gurode, and Leonard Davis back then. You may also remember that in 2010, it appeared Colombo, Davis, and Kosier were all nearing the end of the road, with Colombo not far behind. They were an aging offensive line and pretty expensive, too. They had a season that cratered with a 1-7 start, an injured QB, and an offensive line that got old all at the same time. In addition, the philosophy that was pretty much all gap (man) blocking that enjoyed a guy like Kyle Kosier pulling in space (and sometimes big Davis) under the coaching of Hudson Houck was losing steam as something that may have become antiquated (even though it still was working in certain corners of the league) and more teams were leaning towards zone blocking schemes and smaller linemen versus the bulldozers of the past. That led us to 2011 where Houck was going to get a chance to make the OL more of a hybrid line, but after the cap purge of Davis, Colombo, Guode, and Flozell in about 18 months, he was going to get a chance to work with a rookie star-in-training in Tyron Smith, but also would have to replace veterans with other rookies (Bill Nagy) or virtual rookies (Phil Costa) who would both start in Week 1 without really ever doing anything but being present when everyone else was cut. Kosier remained (although his body was shot) and Doug Free was the one remaining starter who had a chance. Easily predictable to everyone but apparently the Cowboys front office, 2011 was an amazing disaster from the offensive line standpoint. To call Nagy and Costa outclassed is an understatement and by the end of the year, Montrae Holland was called in off his couch and Kevin Kowalski, yet another undrafted rookie, were being overrun by the Giants in Week 17 as a battered Tony Romo took all of the national blame. Yes, paying offensive linemen less allowed the Cowboys to spend elsewhere, but the neglect and ill-advised ideas of 2011 are never discussed enough, but of all of the Jerry Jones evaluation train wrecks, I don't think the decisions to set sail with Costa and Nagy as starters in 2011 ever gets enough publicity. It might be the worst idea this administration has ever come up with. As is the habit, they found blame in the coach Hudson Houck and retired him after 2011 because he could not make practice-squad players into starters, and in comes Bill Callahan to fix things in 2012. Except, yet again, we had no plans to invest in the offensive line (because of that salary cap again) and it appeared the drafting of David Arkin was no more successful than the Nagy/Costa/Kowalski ideas of 2011. So, in comes 2 starters who were both cheap and easy to acquire because their former teams seemed to have no plans to keep them in Mackenzy Berndeau and Nate Livings. Also, they traded for the guy who would start the whole year at center in Ryan Cook just days before the opener. Costa, who was hurt almost all of preseason got hurt on the first drive of the season, and in stepped Cook for the rest of the year. Bernadeau and Livings were ok, but Livings' body was also breaking down and his play was inconsistent. Cook missed a few games and Derrick Dockery was signed and put in the games over Arkin, letting us know how things must be for him. Free and Smith switched spot and Tyron kept developing as the least of the problems on this line now at left tackle for the next decade. 2013 was even more odd at first. Doug Free was given a pay cut or an exit, and ultimately decided that a starting job was worth more than his anger over the cut. Ronald Leary, a 2012 undrafted free agent was given a chance to flourish despite concerns about a degenerative knee, and most importantly, the Cowboys invested with a 1st round pick on Wisconsin center Travis Frederick and then were widely criticized for reaching on that pick. Zone blocking was all the offseason chatter and despite plenty of flirting with veteran guards in the late summer (remember all of the Brandon Moore story lines?) and the realization that Nate Livings' career was over, the Cowboys finally were able to bring in Brian Waters after the season opener. Waters played for about 2 months before his body was no longer capable of performing, which mysteriously fit Bernadeau back into the lineup and suddenly the Cowboys with a front line of Smith, Leary, Frederick, Bernadeau, and Free actually seemed to figure out zone blocking in the 2nd half of the season. They feel great about Frederick and Smith, a bit leery about Leary (sorry), due to all of the same reasons that he slid out of the draft - his health, and Bernadeau and Free are both marked as temporary help until they have a better idea. Which, at the present, they do not as depth on the offensive line is as low as ever. And that is why we spent last week looking at Doug Free replacements and this week we need to examine guards for the future. There are 2 guards that are above the rest of the field and in my mind, it would be a pleasure to get either one of them. They both look like absolute studs to be, but for different reasons. Yankey is another Stanford guard, and although I bristle when people paint players from the same place as similar only because they attended the same institution, it is fair to say that if you went to Stanford in this era, you were part of a physical, pounding offensive line that was going to control the line of scrimmage and also try to control the game. He isn't David DeCastro and there may be a thing or two that are not as great as he was 2 drafts ago, but he is really good. Yankey is strong and can move. He is the pulling guard for Stanford who comes from left guard around the center into the right side of the line or out to the sideline and destroys everything in his path. His times weren't impressive at the combine, but he has quickness and gets out in space well. When he is protecting I saw no issues at all. Going forward he pushes guys off the play and backwards and demonstrates football strength that might not be obvious on the bench press, but it is evident when you watch him play. One of the other aspects of his game that is quite appealing would have to be the way that he sees everything that is around him. Very mindful of blitz pickups and stunts and seems to have a really good awareness, which is something that is noticeable - good and bad - with many linemen. Some have clear tunnel vision and are only able to see the man they are blocking and never are able to adjust to stunts or blitzes or movement to help save a play. Yankey clearly is trained in these areas quite well. If he has a weakness, and there are almost none, it would be how he looked in various short yardage situations where he appeared to not have the same leverage ability that he had in normal spots. Perhaps he allowed a defender to get lower and therefore the play caved in - most notably at the end of the Rose Bowl against Michigan State, but I saw that a few times and that may be where his technique will use some work. But, again, that is not anything to get too alarmed by when you consider the full picture. I think he is a fantastic guard prospect who can do everything you need, but because of his ability to pull and run, he might be a better candidate for a man-blocking scheme. He has played left tackle and left guard, but when you are stacking the guards, this is the one I like the most. Now, Filo is the one who most people have as the top guard, and you won't get a huge argument from me on Yankey over Filo, save for a few small details that we will get to in a moment. Filo also played guard and tackle at UCLA and did so this season where he pretty much split the year between the two spots. He is likely best suited for a zone scheme as he has that size and superior speed to Yankey. Unfortunately, he also gives up some power and leverage and that is where I would give Yankey the nod, because I saw them both play against the very strong Will Sutton of Arizona State and while Yankey appeared comfortable, Filo had a really tough time holding him off. You could see that he had his hands full against a quick 3 technique who could use power and hands to shed off a guard who may not be as stout. But, make no mistake. He can mow guys over when he is run blocking. He absolutely punishes guys and is looking to rock defenders when he makes contact. This can cause the occasional big miss as he is leaning to gain power, but I will take that over some of the guys below who play a far more docile blocking game and play with less power than you would like. Filo honestly seems like a rare bird who actually is a guard who looks more suited for tackle to me. I say that because we often see guys in the other direction, tackles who might be better suited for guard, but seldom the other way around. But, in this case, Filo's feet are so solid, that if he was just a straight tackle, he might be the type of guy who can move with any speed rusher, get out and run block, but also not have to take on giant inside defensive tackles so often. If I took Filo, I might want him to eventually move out to tackle. He also seems quite aware and able to coordinate the entire line with his handle on what the entire defensive front is doing and seems to be comfortable being the leader of the group. I really think this guy is another 1st round talent who should be very good for a long, long time. But, all things equal, I think I like Yankey slightly more. The next level shows us this big man from Mississippi State, who some like more than the other two simply because he is the definition of the old school mountain of a man who is ready for an inside street fight all day long. Gabe is a massive man who started 52 straight in the SEC and has handled himself quite well. You are not getting around him unless you are willing to run your way right out of the play. He is a mauler and as you can see by 30 bench press reps, he can sustain his strength well. In looking at him as a LG, there are some limitations that make you understand what you can and cannot do. One, he is not going to be on the move very often. If you keep it simple, he can get to the 2nd level and smash a LB in space, but please don't ask him to change directions much, because he doesn't hit moving targets every time. Two, his pass pro is great, but it is not a drop at all, he pretty much dares anyone to move him off his starting point and while this isn't a big issue, it does leave larger gaps in a pocket that make a team more susceptible to running LBs or DBs off his gaps because he is not closing down the pocket. But, other than that, he might be able to zone block, and he can certainly man block with ease. He is a really impressive prospect who I like quite a bit, and worthy of a Top 50 pick. There was a lot of time last fall where everyone felt that Richardson was a 1st round talent who could go in the top half of the top round. He also has a fantastic story as a man who has already dealt with so much adversity that anything the NFL shows him will not be that big of a challenge. However, Richardson was not nearly as impressive on tape as I hoped he would be and is clearly a step back for me than the 3 names above. Despite appearing to be a wonderful combination of absurd size and decent wheels, I found the most disconcerting issue to be that his strength does not translate to the football field as much as it should. He seems to be unable to maul people and move defenders out of the path the same way that Jackson or Yankey could. Regardless of the play called, and Baylor is doing plenty from the Shotgun and even though they run a lot, it is from spread type formations, Richardson looks to be really extending himself to take over a battle in the trenches. It would be great to see him dominate people like other players in this class, but if you pop on a game like the home game against Oklahoma in November, you just didn't see much of that at all. I also watched the Central Florida and Texas Tech games for Richardson and in viewing him in about 250 plays or so, found his performance to be very inconsistent and while he can clearly turn into something special, I did not see enough of that to say he is a special prospect. His feet were disappointing, but his strength never seemed apparent and his technique needs work. These inside guys win on leverage and knowing how to use weight against their opponent, but Cyril seems to let defenders get so tight on his chest that he just cannot control them like some of the accomplished guards up the ladder from his spot. He also was destroyed on a few stunts and was too upright on pass protection, which again zaps a player of their strength. He just seldom gets the push you would expect of a guy who is 330 and plenty strong. He has a very full tool box, but I fear that unless he is well coached, he may be just another talented player who did not put it all together. He is worth the trouble if I have time to develop him, but there is not a real scenario where I think he is ready to start in the NFL in 2014. Brandon Thomas is a lot like last week's prospects in Zack Martin, Antonio Richardson, Jack Mewhort, Morgan Moses, and Billy Turner, in that they are all college tackles that might fit better in the NFL as guards. Thomas played almost his entire career at tackle at Clemson, but many seem to project him better as a player inside. This is generally code for the idea that they lack the quickness against the Von Miller level edge rushers who populate the NFL and would be better in tight spaces where they can avoid the quick-twitchers in open spaces. Thomas has some very impressive movement skills and shows it most of the time, although you can find snaps where he looks like he is laboring to get down the field. It happens. You can also see where he is dealing with issues in pass protection against smaller edge guys, especially when Ohio State pushes him a few times with knocking him off balance and beating him back to the inside. He is athletic and has very long arms and that helps him deal with issues in his gaps a lot better and I can see why he is a much better guard prospect, given his height and his feet that might be a count too heavy. He has really good straight ahead power and also closes off the gap nicely when he is run blocking and turns his body to wall off the defenders from getting to the runner. These are all very useful characteristics that will come in handy. I honestly think he would be a reasonable tackle or guard and although I would never seem him as a world beater at tackle, he is ready to play at a level that is satisfactory at tackle in the NFL, but could be much better than satisfactory if you put him at guard. I see the theory here, but knowing how many tackles flunk out and are moved inside to play guard, you can then surmise that guard is over-populated in the NFL and therefore there is not a huge need to spend too high a pick on something that exists in great supply. I hope that makes sense. There is no shortage of guards around the league who were once tackles. He is useful, but the question would be if anyone thinks he is worth a 2nd rounder. Here is another prospect who many believe is in the mix for the Top 50-100 and also was a tackle at Furman, but most have him positioned as a guard at the next level. I also think Dozier is what you would consider to be a real prospect for zone blocking teams which, of course, would put him in play for Dallas at a certain point. I do want to make a confession in the interest of transparency, in which I don't like to comment on a player if I have not watched enough of his play to feel comfortable knowing the player. This, for me, requires about 200-300 snaps and although that is not the complete picture of a player, it is a big enough sample that I feel like I have the overall idea of what he is all about. In the case of Dozier, I tried my best to find some Furman tape, but only was able to find Clemson 2012 and the East-West Shrine game, which sort of counts, but all-star games have their own issues as well. Anyway, I see him as a guy who can play tackle or guard and a player who looked fantastically comfortable in every situation as a player who is strong and clear on what he is supposed to be doing. He turns his man and walks him off in the run and looks able to get his kick steps in and is in a great spot to receive pass rushers in protection. He occasionally gets beat on the snap count by quickness to either gap, but overall, there is plenty to like here and he is an exciting prospect. The trouble is, I certainly didn't see enough snaps - maybe 100 - to feel like I saw everything. So, until further notice, I really like him, but need to see more. My summary is this: Tier 1 is all about Yankey and Filo who are both great, but it might depend on what you are looking for as it pertains to your particular need. Jackson is a step down, but still very solid. Richardson and Thomas are mysteries in that they are not finished works and your ability to develop them will impact where they go from here. And Dozier is a small-school guy who might belong higher than he is if he just had more exposure. Of course, NFL teams have access to all of his work, so I wouldn't be shocked to find out Dozier is up with Gabe Jackson as legit 2nd round prospects. Our next episode will look at QBs. Take heart, Cowboys fans. There is some good news this spring. Littered amidst the exits of the few exceptional defensive players and the back surgery of your QB who has $42m in dead money on his deal if it doesn't work, is a move that might start turning this defense around. The Cowboys signed Henry Melton last night to a deal that appears to be a 4-year deal worth $29m, but with only 1-year and between $4-5m guaranteed. The particulars of the deal would certainly be called unique and having as much to do with Melton's knee injury and his pending litigation in Grapevine (which also happens to be his hometown) as it does with his ability. Let's get one thing straight, I have no idea what kind of a guy he is, and reports of him biting a night-club employee is somewhere between a red flag and another reason why professional athletes should do their drinking at their homes, but I am only here to discuss the football impacts of this signing and will leave the psychological profiles to the field of willing and capable writers. But, when we sat here a year ago and saw the pending doom on the horizon, one of the pipe dreams that rolled down the hill was looking at the expiration of dominant defensive tackle Henry Melton at the end of the 2013 which would sync up perfectly with the expiration of Jason Hatcher and Anthony Spencer's deals. Knowing the Cowboys affinity for players from the regional college football powers (if you are a Longhorn, Aggie, Sooner, Ok St Cowboy, Razorback, etc, the Cowboys have watched you closely on Saturdays - this theory is more than a running joke) and their transition to the Bears scheme under Lovie Smith and Rod Marinelli, it all seemed to make sense that target #1 in the spring of 2014 would be Henry Melton. Unfortunately, the Bears, with no cap issues at all, would be smart enough to lock him down and make sure he plays his prime years in Chicago - not just his developmental years. Well, if his goal was to play in his hometown with his hometown team in 2014, then the incidents of the 2013 season all played perfectly. Because I don't think for a second that Chicago was planning on letting him get away for nothing back in September. But, then his ACL happened which cost him the remainder of the season. I am sure if this was 1994 and we heard about an ACL, we would all be properly freaked, but the way the medical world has shown us that this is no longer a big deal and guys are often back in 8-10 months tells us he is fine - as have all of his exams during this free agency tour. Then, in December, while unavailable to his team, he had an incident at a Grapevine night club (who knew?) and is going to owe someone a fair amount of money for doing something stupid that may or may not have involved his teeth. I imagine, in light of the Sam Hurd legal issues of 2013, nothing makes the Bears recoil like a nice mugshot and perhaps the conviction to not let this guy get away started to lose steam. ACL and arrest in his walk year? That is the difference between $40m and $4m. And while it can all be made back down the road, he made his bed and now must live in it. However, if he wanted to play here, and I have no idea if that was his goal, then the waters parted magically to make that happen, because the Cowboys were never in the $40m game. But, $4m? OK, that can happen. Especially if Jason Hatcher was going to be able to get $10m guaranteed and 4 years/$27m from Washington at the age of 32, right? If you told me I could replace a nice player like Hatcher with a 27-year old I actually like more at a savings or at least similar money, I would have jumped at the chance. Losing DeMarcus Ware is obviously something you wished to avoid. However, if your plan was to go get Melton, find a short term option on the edge like Anthony Spencer or Jared Allen on a very easy deal, and then consider a 1st or 2nd rounder on yet another havoc causer up front, then you had a reasonable plan in the offseason to rebuild this thing in just a few months. Let's talk about Melton the player. For me, he is a very versatile player who can do a lot of things. In fact, if you go back to his 2009 draft, he was considered a candidate to move to OLB in a 3-4 and was sort of a find because his college team-mate Brain Orakpo was getting attention out of Austin. They would look at Orakpo on film and Melton, despite playing only a year at DE in college, jumped off the screen and on to the radar. Now, one thing about Melton should be stated. I think this is obvious with just about every player in NFL history, but based on the attitude of the masses with regards to DeMarcus Ware's 2013, I figure I better state it clearly: Supporting cast matters! Below, you will see Melton throw a center (Geoff Hangartner) out of the way on his way to nailing Cam Newton. Great to see. However, notice that he has Julius Peppers, Lance Briggs, Brian Urlacher, Israel Idonije, Shea McClellan, and Major Wright all occupying blockers on this play, too. While that is not the 1985 Bears, the 2012 Bears still had some decent personnel at times. And that matters. Melton is not doing this himself. So, to add only him and to clean your hands off and act like this is all fixed is ridiculous. I know most of you know this, but sometimes, we need to be careful as to assume it is clear to all. DeMarcus Ware can still play and you will see what he will do with Von Miller on his opposite flank. Melton is really good against the run as a penetrating force. In fact, there are very few DTs in the NFL that did better than he did in 2012. He is quick and dangerous and gets to plays in the backfield on a regular basis. He shoots that gap and isolates guards in space and beats them regularly. He is a very good player in this setting. However, he is certainly not big enough to anchor when someone wants to clear him out like Minnesota's Matt Kalil here. This is why 3-technique looks for quick and penetrating, not stand your ground types. You can't have everything there and what Melton has in quickness, he does not have in stoutness. That is fine - your DE and LBs need to clean up a zone play like this. But, it is something to be aware of. We will certainly visit about what this does for the draft and what this does about targeting a 3-technique which has admittedly been the top priority for 15 months now. They have one and they have a very good one. This is a very nice piece of business because the risk factor is incredibly low if they do not like how things go in 2014, they walk away with no dead money and no regrets. I don't know how this can be positioned as anything but a fantastic signing. Will it make them a power on defense? Of course not. In fact, losing Hatcher and adding Melton likely can at best be a "break even" from a season to season perspective. But, getting younger and replenishing on good contracts is what this is all about. They still have time to do more in free agency (I think Spencer can be had at a very similar price on a 1-year deal) and then go invest in defensive help up high in the draft. Add that to getting Bruce Carter and Morris Claiborne up to their skill levels (which is what coaching is all about) and you can see how the Cowboys should have a reasonable bounce back defensively in 2014. This is a very nice piece to add and to think it would have never been possible had he not had his incident in Grapevine sure puts an odd spin on the arrest. The Cowboys got their top offseason priority target and they didn't pay much to do it? Let's just get this through our heads right now. They aren't going away. They aren't going to lay down and they sure aren't going to make this easy on you. So, before we start this entire game, just understand that simple fact. The Phoenix Coyotes, a team that you likely have very little regard for, owns the Dallas Stars right now and you might not even know it. My first real thoughts about the Coyotes was disgust, due to a sadness that tiny, sweet Winnipeg was losing its Jets to indifferent Phoenix in 1996. Then, they took advantage of William Wirtz and his Chicago nonsense by fleecing the Blackhawks for Jeremy Roenick that same summer, who then joined Keith Tkachuk and Shane Doan to form a scrappy team in the desert who were both entertaining and abrasive. Next, of course, came the Hatcher/Modano/Roenick connection and the beauty of the one of the most heated feuds in Dallas Stars history, but as the Stars were winning every year, the Coyotes of Roenick and Tkachuk were 1-and-done for 6 out of 7 seasons and an annual punchline. Late in the 2000-01 season, right about the time Wayne Gretzky was part of an ownership group that took over the team, Tkachuk was traded to St Louis and then later that summer, Roenick went to Philadelphia in free agency (the Stars thought they were in on him, and the settled for the Pierre Turgeon consolation prize). Thus ended the Coyotes playoff era, save for one last 2002 1-and-done. From there, 6 years of incredibly poor hockey, worse attendance, an arena move out of downtown Phoenix, Gretzky named himself coach, bankruptcy, rumors of several moves to Canada, and finally, the league takes over operation of the franchise. You may recall that Brett Hull was their big free agent signing (2 years/$4.5m) before the 2004-05 season (the lockout cancelled season) and played the first 5 games of the 05-06 season in his dad's #9 before retiring with 1 assist as a Coyote. So, how did the Dallas Stars, their brethren in bankruptcy in 2009 turn the Coyotes around? 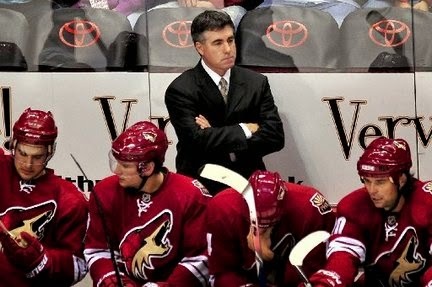 Well, as you may recall, Dave Tippett was hired to replace Ken Hitchcock in 2002 (with Rick Wilson watching the bench in between for a few months) and the Stars went to the playoffs in each and every season from 02-03 up until '08 when they made their Western Conference Finals run. As you may recall from last week, that led to the summer of Sean Avery's signing which was Hull's last big Stars idea and effectively set off a grenade in the Stars room that they did not recover from in that entire 2008-09 season. Hull and Tippett were voted quickly off the island after that season, Hull by the hand of ownership (what was left of it) and then new GM Joe Nieuwendyk dismissed Dave Tippett on his first day in office in early June 2009, and thus ended Tippett's 9-year run in Dallas. At the time, it was sold as a fresh start and pretty much everyone accepted that the era had "run its course" and it was time to turn the page. Tippett returned to his cabin in Minnesota that year to examine his options and to relax, knowing he would land on his feet after doing such a fine job for so long in Dallas. By the end of the summer, he had accepted an assistant coach job in Phoenix to work with Gretzky who had spent 4 years behind the Coyotes bench and never was able to make heads or tails of the whole thing. He was also caught up with all of the many issues involving bankruptcy, relocation, and various ownership bids and it seemed his run was ending. Tippett is the most qualified man in the room as Gretzky is stepping down amidst the chaos in September of 2009, so he takes over what is widely regarded as the worst, most impossible job in the NHL. A Phoenix team with limited talent, no funds, and no fan base is his next coaching gig. 13-14 75 ??? 77 ??? That 36 point advantage for Phoenix is an average of 7 points per season difference between the Coyotes and the Stars. That is significant and a sign of clear superiority over the stretch. It is impossible to measure talent discrepancies and effects of each team dealing with bankruptcy and league control of their franchises, but if there is one single move that seems to have changed the course of two different franchises, it would seem to be the firing of Dave Tippett. Can it be traced all the way back to Sean Avery? Sure. But, the dominoes didn't have to fall like this. They did and it is what it is, but wow. So, here we are on the morning of March 18th. Phoenix has now pulled ahead of the Stars in the standings for the first time since the Olympic break, having played 2 more games than the Stars. They still have Tippett, still have Mike Smith in goal, now also have Mike Riberio as one of their top offensive players and even old friend Jeff Halpern scored the game winner in Los Angeles last night. They aren't going away. They never do. They have had the same financial handcuffs on and yet have still outplayed the Stars for just about every second of every day since Tippett was fired. Now, the Stars try to turn history as the new regime in Dallas is just trying to fix the issues. But, despite the divisional changes, it is still that annoying team in the desert standing in the way. And, as we have mentioned, Game #82 is in Glendale. Surely, that game will mean plenty, won't it? Get used to them. To go to the playoffs, you must face them and strike them down. They are not going to go quietly. Do not underestimate them. You have no right to do so around these parts. Well, I will tell you Brian, I am not a great resource for knowledge of hockey prospects. I get interested every year at draft time, but then I fall out of touch during most of their growth except for checking in with the brass from time to time on the relative progress of each of the kids. The players who are in juniors, US colleges, or even the AHL are all subject to the roller coaster rides of development, so unless someone is interested in watching 10 games of a player, the are risking getting anecdotal info that might actually be misleading. That is a long way of saying, I am not the guy to ask. However, I do know that Jim Nill and his crew believe in taking it slow. Very slow. They believe in it because it has worked over the course of time to let each guy prove his worth at each level. That is why Jamie Oleksiak has been in Austin all year and has been playing those who can aid his development at a level that can assist his confidence. They have plenty of hopes for him, but they want him to set his own timetable. In prospect talk, we get tired of hearing a guy's name for 3 years. But, in hockey, that means he has gone from 18 to 21. 21 is still a very young athlete and they aren't all Tyler Seguin. They are very high on Oleksiak and Brett Ritchie, John Klingberg, and Jack Campbell - and all can knock down the door as soon as next season. They are moderately high on Radek Faksa, Patrik Nemeth, and Devin Shore, but they are the next wave or have a lower ceiling (in Nemeth's case). The system is in good shape, but they are still thought of as in the bottom half of the league in terms of talent. I am sure that would be way different if Val Nichushkin was on the farm - their ranking might be Top 10 with just that one adjustment - but, these rankings are not that important. Production at the top level is ultimately all that matters. The farm is better, but still plenty of room for studs who can take over games. It seems a lifetime ago we lost the great Zubov. We have seen countless "next" prospects come and go. Vishnevskiy, Larsen, and now the new "next" prospect John Klingberg. If Oleksiak is to Matvichuk/Sydor, and Nemeth to Hatcher, then Klingberg must be Zubov. How high is Klingberg's stock in the front office? Will he be in NA next season? Do you think he might end up in the NHL by the end of 2015? P.S. Who goes to make room? Klingberg is the one they are excited about as a dynamic defensemen with the puck who can do magical things on the point of a power play. He is still in Sweden playing big minutes, and they would love for him to play a year in Austin before rushing him up here, but if there is a Zubov-comp (Yeesh, why do that to the poor kid) it would be that Swede. The other, Nemeth, is thought of as a big, stay-at-home guy who might be the Nik Grossman of his office - I don't think Hatcher works for me. So, could Klingberg get here within 12 months of this blog? Sure. But, that might be pushing their perfect plan. But, yes, Dylan. Odds are good that these new prospects will be more like Larsen than Zubov. There just is a thing called reality that always gets in the way of these guys breaking off Hall of Fame careers. Bob,As great as Seguin and Benn have played together this year, the other forward spot seems to be open. If we get to the playoffs, who do you see Lindy using on the top line with Jaime and Tyler? Does he go with Val or does he go with a veteran like Erik Cole? Wow. This assumes the Stars make the playoffs, so this would make me very happy under all scenarios. I anticipate in just smiling throughout the playoffs if they happen. No stress. No expectations. Just smiles that post-season hockey is back. But, I suppose if this were to happen, my calm would last until the puck drops and then I would raise my bar of expectations. Who is their 3rd? Well, honestly, Val is struggling recently and looks like he may have already played his best hockey of his 18th year on this planet. Who can blame him? This has been an incredible experience for him. But, does he have still another gear? And if not, who goes up there to stay with 14 and 91? Not sure. Obviously, Rich Peverley was the best other option, so maybe this is something they work through for the next stretch. Alex Chiasson spends enough time with those 2 on the power play that this might actually be the play. I like Erik Cole where he is and that is as sort of the lead dog on the 2nd line and he has been great in the last month. But, let's just focus on the playoffs, which for Dallas are happening right now, I suppose. On the new individual retirement banners, Broten's says -'95. He came back and played in 97 though and the original banner we put up said '97. What up with that? I will be honest. I have no idea about your Broten banner question. Let's just leave it at that. On Tim Thomas, I rather enjoy his flopping around style. It reminds me of an era gone-by that doesn't seem to exist much in the league anymore, and especially in a place that has Kari Lehtonen starting 65 games a year. Thomas is a competitor, but certainly not teaching courses on sound tactics between the pipes. It is compete and battle through and through for him. I think that is his style and Marty Turco had a similar style that when it is right it is magical and when it is off, it looks like he is just flopping and guessing. Not everyone is 6'5. Those who are smaller and under 6 feet tall have to battle in other ways. It seems strange to me that the entire defense tends to follow the play of Alex Goligoski. If he's bad they're all bad and when he plays well they follow suit. How is that he has such an overwhelming effect on the entire defense? Well, talking about Alex Goligoski is its own industry sometimes, and after the Calgary and Winnipeg games, #33 is back in the crosshairs of criticism for looking absolutely poor at various times and generally those poor times are leading right to scoring chances or goals. And then the camera always catches him skating away looking at the ice in defeat. His confidence level is very apparent and easy to perceive when it is low. He returns to Pittsburgh tonight where another defensemen plays who had major confidence issues in Dallas, but now that he plays with Sidney Crosby and Geno Malkin, Matt Niskanen is one of the highest plus/minus players in the game. It is a team sport and Goligoski has plenty of talent and use for this franchise, but he has to get his spot in order and right now with his pairing with Trevor Daley, that particular duo have got to be better for this thing to get to the finish line. They are playing tough minutes against tough competition, but this team has no better idea right now and these are the cards they have to play. Enjoy Pennsylvania, and let's hope the Stars can leave with a few results.